A top aide to Kim Jong Un will make a rare visit to Washington Friday to hand a letter from the North Korean leader to President Donald Trump, Secretary of State Mike Pompeo said after reporting "good progress" in talks between the two sides to revive an on-again, off-again nuclear summit. "I am confident we are moving in the right direction," Pompeo told reporters at a news conference in New York after meeting Thursday with former North Korean military intelligence chief Kim Yong Chol. "Our two countries face a pivotal moment in our relationship, and it would be nothing short of tragic to let this opportunity go to waste." He would not say that the summit is a definite go for Singapore on June 12 and could not say if that decision would be made after Trump reads Kim Jong Un's letter. 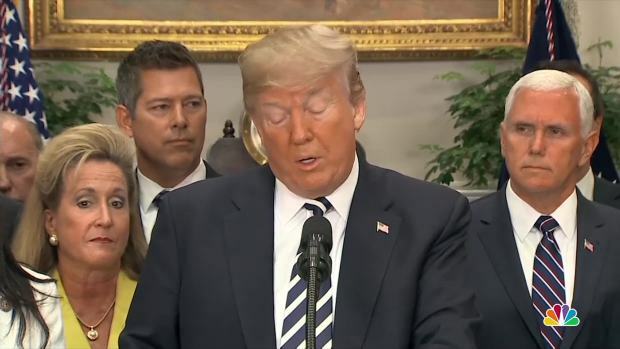 However, his comments were the most positive from any U.S. official since Trump abruptly canceled the meeting last week after belligerent statements from the North. The two countries, eying the first summit between the U.S. and the North after six decades of hostility, have also been holding negotiations in Singapore and the demilitarized zone between the two Koreas. Early Thursday, Trump told reporters "we are doing very well" with North Korea. He added there may even need to be a second or third summit meeting to reach a deal on North Korean denuclearization but still hedged, saying "maybe we'll have none." Kim Yong Chol is the highest-ranking North Korean official to visit the U.S. in 18 years, and his trip to the White House will be a highly symbolic sign of easing tensions after fears of war escalated amid North Korean nuclear and missile tests last year. Pompeo, the former CIA chief who has traveled to North Korea and met with Kim Jong Un twice in the past two months, said he believed the country's leaders are "contemplating a path forward where they can make a strategic shift, one that their country has not been prepared to make before." He tweeted from New York: "Good progress today during our meetings" with Kim and his team. Yet he also said at his news conference that difficult work remains including hurdles that may appear to be insurmountable as negotiations progress on the U.S. demand for North Korea's complete, verifiable and irreversible denuclearization. Pompeo spoke after meeting with Kim Yong Chol for a little more than two hours at the residence of the deputy U.S. ambassador to the United Nations. The talks had been expected to be held in two sessions, one in the morning and one in the early afternoon, and had not been expected to conclude until 1:30 p.m. Instead, the two men wrapped up at 11:25 a.m.
Pompeo said they finished everything they needed to address in the morning session. Immediately afterward, he tweeted that he had had substantive talks on the priorities for the potential summit. 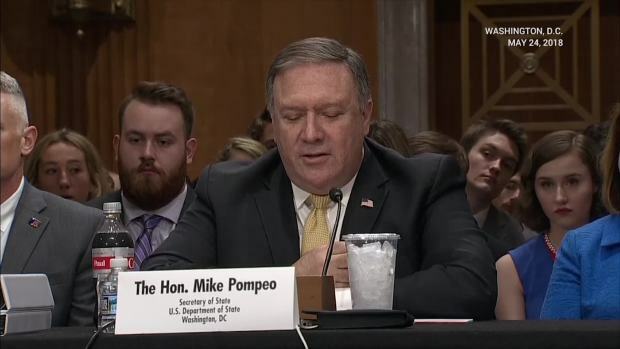 Pompeo was accompanied by Andrew Kim, the head of a CIA unit assigned to work on North Korea, and Mark Lambert, the head of the State Department's Korea desk. "Our secretary of state is having very good meetings," Trump told reporters at Joint Base Andrews before departing on a trip to Texas. He said of the North Koreans, "I believe they will be coming down to Washington on Friday. A letter being delivered to me from Kim Jong Un. It is very important to them." "It is all a process," he said of arranging the summit. "Hopefully we will have a meeting on the 12th." Despite the upbeat messaging in the United States, Kim Jong Un, in a meeting with Russia's foreign minister on Thursday, complained about the U.S. trying to spread its influence in the region, a comment that may complicate the summit plans. "As we move to adjust to the political situation in the face of U.S. hegemonism, I am willing to exchange detailed and in-depth opinions with your leadership and hope to do so moving forward," Kim told Sergey Lavrov. 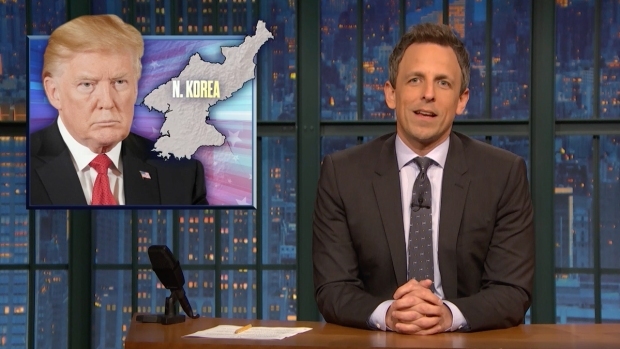 Seth Meyers takes a closer look at the president canceling his summit with North Korea and pushing a baseless conspiracy theory about the Russia probe. Kim Yong Chol, vice chairman of the North Korean ruling party's central committee, was allowed into the United States despite being on a U.S. sanctions list, and North Korean officials are not normally allowed to travel outside the New York area. The North Korean mission at the United Nations did not respond to an email seeking comment Thursday, and phone calls were not answered.